Brazil's presidential election is underway and heading to a fast-approaching runoff date of October 28 between right-wing candidate Jair Bolsonaro and leftist and former mayor of Sao Paulo Fernando Haddad. As of now, the exit polls conducted by Ibope Polling for the first round of Sunday's votes put the right-wing Bolsonaro ahead of the former mayor. The poll puts a 45% tally of votes for Bolsonaro compared to 28% presently going toward Haddad - a decisive victory for the right. The poll still has a margin of error of plus or minus two percentage points. The results were released by local television station TV Globo. Update: 68% of all voters have been counted and Bolsonaro was still ahead with 46 percent. Haddad holds a measly 25% and will need a drastic jump to compete with his right-wing challenger. Left-wing proponents say much of Haddad's supporters lie in concentrated regions in northeast Brazil and is more difficult for them to report electoral results as quickly. The Institute of Ibope suggested Bolsonaro could achieve a win with the 45% of valid votes after conducting an exit poll of 30,000 voters. Bolsonaro is a 63-year-old former army captain who gained notoriety after a near-fatal stabbing at a rally one month ago that kept him from campaigning. The video of the assault was gruesome and the attack nearly cost Bolsonaro his life. While he was not as present in the campaigning process, people know of his desire to continue and voted with him anyway. 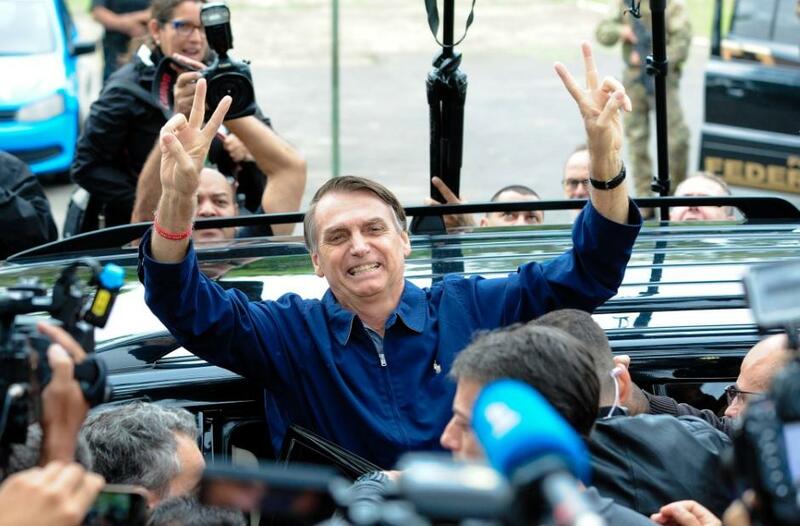 Shortly after the stabbing attack, Bolsonaro appealed to his followers on social media who rallied in support of him to win 50 percent of the votes and take the election's first round. Many would say the result is expected and far-left media outlets like the Washinton Post released hit pieces comparing Bolsonaro to President Trump as if having similarities with a billionaire patriot is a bad thing. The sheer number of ht pieces out to discredit the right-wing candidate is astounding and it makes it even more obvious to the everyday voter who is pushing a political agenda and who is innocent. Don't forget to take a look at the opportunity to capitalize as an investor on the shift of power in Brazil. If you wondering how you can cash in on some potential Brazil asset moves on Election night I've got you covered. Bloomberg reports, "The first choice would normally be a Japanese exchange-traded fund that tracks the benchmark Ibovespa, but that market is closed for a local holiday. So the next-best option for equity investors might be Singapore’s relatively illiquid X-trackers MSCI Brazil UCITS ETF. Some U.S.-listed ETFs can trade at off hours, though again it may be difficult to find counterparts at that time of day." If you'd like to learn more about the story about investing from Bloomberg <a href="https://www.bloomberg.com/news/articles/2018-10-07/here-s-how-to-trade-brazil-assets-overseas-on-election-night">you can read it here.</a> The real challenge will be correctly gauging the people's reaction to one of the most polarized elections since the end of the military dictatorship in 1985. Haddad is still a former education minister and being mayor of Sao Paulo most have certainly earned him some connections and support. It will be a final battle to see who is stepping in for the former President Luiz Inacio Lula da Silva. Da Silva was jailed and is currently serving time for bribery and money laundering charges.